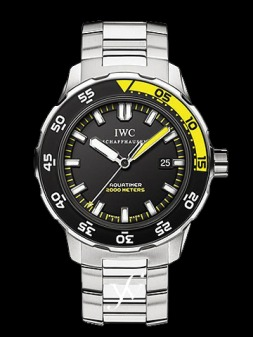 The International Watch Company (IWC) is a Swiss company, founded by an American. Florentine Jones made the decision in the 1860s to establish a manufactory in Switzerland. In so doing, he was able to take advantage of the Swiss watchmaking expertise and lower wages of the workers. Jones was not well-funded, however, and he eventually had to give up control of the company. Over the years, the company changed ownership many times and experienced a veritable roller-coaster of success and failures. Today, however, the IWC is a strong participant on the world stage of luxury timepieces. Aiming to produce watches of the highest quality and technical design, the IWC is a major contender in international sales of fine wristwatches. Though the company has experienced much fluctuation in profitability over the years, excellence has won out and they now have a secure spot in the global market. * IWC's first digital watch was created in 1885. * During World War II, the company created the first oversize anti-magnetic pilot's watch. The early models of this line are a prized collectable today. * Among the record breaking "firsts" in watchmaking, the Ingenieur is a diver's watch that can withstand water pressure at 2000 meters. * One of its most impressive innovations is the DaVinci watch, a perpetual calendar chronograph that is mechanically programmed for the next 500 years. * In 2000, IWC released the 5000 calibre, a mechanical movement that has a power reserve of seven days and an automatic movement. Da Vinci: Small Da Vinci Featuring the same mechanical chronograph movement of its larger sibling, this small version boasts a variety of innovative attributes. It is self-winding and has a perpetual calendar, four-digit year display, and a perpetual moon phase display. The Da Vinci comes in 18 ct. rose gold with a brown crocodile leather strap or stainless steel with a black crocodile leather strap. Grande Complication Limited to only 50 watches in this line produced each year, the Grande Complication is the symbol of exclusivity. It is a self-winding watch with chronograph, perpetual calendar, and minute repeater. This watch has 659 mechanical parts and features a crown-activated rapid calendar advance. It is available in platinum or 18 ct. yellow gold, with a platinum, gold, or crocodile leather strap. Portofino Automatic Simplicity and style are the hallmark of this watch. Its mechanical movements are set in a convex sapphire glass. The Portofino Automatic is self-winding and has centre seconds with stop function and a date indicator. This watch comes in 18 ct. rose gold or stainless steel, with a black or brown crocodile leather strap or a stainless steel bracelet.